I have a large scar on my back. I can’t see it. I have to describe it by touch. It roughly traces my lower spin, from the middle of my sacrum to about the base of my ribs. It isn’t perfectly straight. There are some small lumpy fat deposits along the side of it. It feels like a narrow valley lined with a tightly stretched bit of plastic. I’ve had the scar for 12 years. Occasionally someone notices the scar when we are dancing or doing yoga. “What happened to your back?” they ask. It reminds me. I don’t think about my back very often any more, and yet much of my life these days is somehow tied into the story of my back. 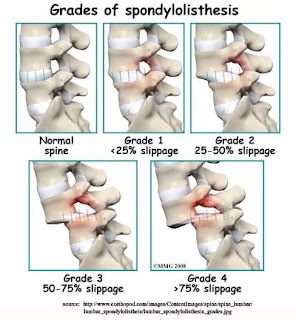 The technical details: In 1996 I was diagnosed with Grade 3 Spondylolithesis. The facet joint between my 4th and 5th lumbar vertebra had broken and the L4 vertebrae had slipped forward over L5 by 2 cm, about 65% of the width of the vertebra. The facet joints are the joints between the wings of the vertebra, on which the spine hinges. They hold each vertebrae in place over the one below while allowing the magnificent range of motion of the spine. The joint was unstable and mobile, meaning that through the day the L4 would slide back and forth over the top of L5 with about a centimeter’s range of movement. The result of the movement was a gradual shearing of my spinal cord and a lot of pain. I was beginning to have foot drop, meaning that it was difficult to keep my left foot in flexion when I lifted the foot from the floor to walk. I had severe sciatica in my right leg. My entire low back hurt all the time. I was losing mobility, flexibility, and the ability to experience joy. I felt like there was a spigot on my low back that allowed all my energy to flow out. Because of my lack of mobility, emotional depression, a body type that easily holds extra weight and a tendency to use food as medication I was also about 30 pounds overweight. The extra weight exacerbated the back pain. I felt and looked bad and that helped feed a negative feedback loop of emotions and eating. I was a mess. I was working as a faculty member at Vanderbilt University as this time. Most of my duties were desk-work. Research, writing, planning classes, and general faculty duties are largely completed in front of a computer screen. I was preparing to come up for tenure the following year. The expectation was that I was to perform as one of the best and brightest researchers and educators in my field. To quote my Dean at the time: to get tenure at Vanderbilt, I should be able to get tenure at Harvard. The work expectations alone were daunting and stress inducing, without the added physical obstacles. The tenure process at high ranking universities has a tendency to kill marriages and deform psyches. In addition my sons were very young, aged 1 and 4. We’d pick up the kids from University childcare, come home, eat dinner, and I’d collapse in bed, thoroughly spent and guilty that I had no energy left to give to them the attention they deserved. They watched alot of tv that year. It was hard on my whole family. Blessings to my sons and Jay for sticking with me through this.